Two of my absolute favorite artists have announced a collaborative album. This is perfect. 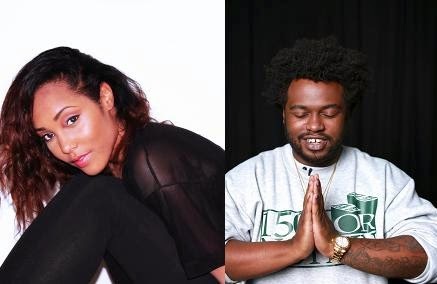 India Shawn and James Fauntleroy are among some of the most respected and loved creatives in the game. Neither is a stranger to this site, but if you are- India is a songwriter/singer whose voice is likened to honey, clear skies, and angels... and James Fauntleroy.. a songwriter/singer whose voice is pretty much like Sunday morning. These two have written for some of your favorite artists, but in my opinion none of that work holds a candle to their individual mixtapes/EPs (Get INTO James' mixtapes). Their music is a real spiritual experience for me, and on even the most basic level of sensation- my ears LOVE it. So, I was super geeked today when I saw that they are once again teaming up..and this time for a whole project. We heard them together on India's Origin EP where James was sprinkled here and there - All I Have & Neither Do We...but a whole project is coming!!! The first off of that soon come project entitled, Outer Limits is a jam they're calling Floating Away. It's a mid tempo groove joint, something both artists create very well. Check it out below and an additional record James dropped today. Listen.. the way I love him. The way I love India Shawn. I'm so hype! Get into the music below. Is there enough freedom in self expression?